MultiBrief: Should Texas allow hunters to use air rifles? Should Texas allow hunters to use air rifles? The Texas Parks and Wildlife Department may soon allow hunters to use air rifles on big game species such as white-tailed deer. When most people think of air rifles, they probably picture something along the lines of the BB guns many of us grew up shooting. However, several different companies have developed much more powerful big bore air rifles better suited to hunting big game in the past few years. For that reason, the Texas Parks and Wildlife Department (TPWD) is considering allowing hunters to use air rifles on big game species such as white-tailed deer during the 2018 hunting season. Among other companies, Crossman Arms, Airforce Airguns and Air Venturi all produce big bore air rifles and/or air bows capable of shooting arrows or pellets ranging in size from .357 to .50 caliber and achieving 200-500 foot pounds of energy at the muzzle. These air rifles clearly fall well short of just about any centerfire rifle in terms of muzzle energy, but they produce far more energy at the muzzle than typical compound bows and crossbows. There is much more involved with judging the effectiveness of a weapon for hunting than just the muzzle energy, but officials at TPWD judged that air guns were worth investigating more for big game hunting. With this in mind, Alan Cain, the whitetail program leader for TPWD, set up a test at a ranch in Texas to judge the effectiveness of big bore air rifles on whitetail deer earlier this year. Cain and his colleagues cleanly and ethically harvested several spike bucks at ranges past 100 yards during their hunt. Plainly impressed with the performance of the air guns they were using, Cain later presented the results of their hunt at a TPWD commissioners' meeting, and most of the commissioners agreed that certain modern air rifles are powerful enough to ethically dispatch deer sized game. If Texas ends up going forward with allowing air guns for hunting big game, the state will likely mandate that hunters use air guns with a minimum caliber, velocity and/or muzzle energy. For instance, current regulations only allow air guns .177 caliber or larger shooting projectiles at a minimum velocity of 600fps for squirrel hunting, so I wouldn't be surprised to see the state mandate a minimum caliber and muzzle velocity well north of those numbers for big game hunting. 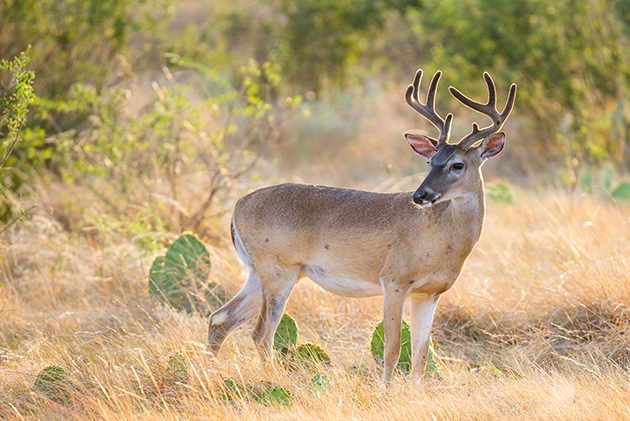 The Texas Parks and Wildlife Department plans on opening up a public comment period beginning in January to hear what people think about using air guns for hunting big game. If things continue to progress on that front, it's possible that hunters may be able to use air rifles during the 2018 deer season. Stay tuned to see how things develop.